Just two hours into the first full day of our road trip, we stopped in Barstow, California. That's where Highway 58 met Interstate 15. We figured we would just grab a quick bite and cup of coffee at some run-of-the-mill fast food joint. 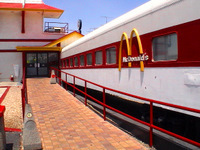 Little did we realize that we would eat in a McDonald's that thinks it's a train. 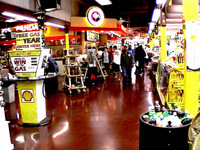 The Barstow Station is one of the most unusual road trip pit stops you'll ever encounter. We couldn't help but add to our already growing collection of road trip pics. Pulling into the parking lot for the Barstow Station. It's oddball attractions like this that make road trips so much fun. Be sure to stop when you see a place like this. If you don't, you'll always wonder what you missed. And if you do stop, the worst case scenario is that you get to use the restroom in an unusual place. This may be the only train in the world with McDonald's branding. Complain all you want about the fast-food-ization of America, but one highly entertaining road trip pastime is to note how different fast food joints look in different parts of the country. Inside, it's more than a McDonald's. 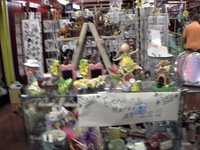 There are several eating establishments, as well as little booths where you can buy lots of random little items. Need a T-shirt that expresses a folksy sentiment? They probably sell 50. We didn't buy any kitsch, but we enjoyed the view. You might find treasure in there! 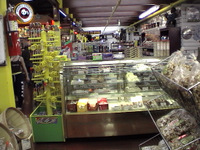 Seriously, it's like Aladdin's cave in there. And here's the kicker: one of the more exotic food stands was selling a soda based on yerba mate, a green tea-like beverage I routinely enjoy at home. Yerba mate soda? It was actually pretty good. This is just another way a road trip can broaden your horizons. If you fly, you don't get to sample all the strange delicacies along your route, do you? What a great place to get out and stretch your legs. 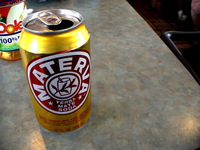 Energized by the yerba mate soda, we hit the road. 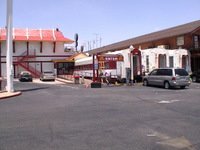 We'll be sure to visit the Barstow Station again next time we pass through Barstow, California. It's one of the most unusual road trip stops you'll come across. Bring your camera.